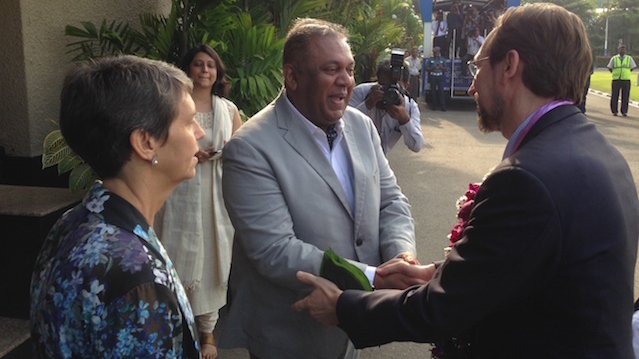 UN Human Rights Commissioner Prince Zeid Ra’ad Al Hussein arrived in Sri Lanka today on a four day official visit. Meanwhile the National Freedom Front led by Wimal Weerawansa is scheduled to protest against Al Hussein’s visit opposite the Lipton Circus later today. During his stay, he will meet President Maithripala Sirisena, Prime Minister Ranil Wickremesinghe and Leader of Opposition R. Sampanthan, Minister of Foreign Affairs Mangala Samaraweera, as well as senior Government officials, civil society representatives, the tri-service chiefs, members of the diplomatic community in Colombo and the National Human Rights Commission. 20,000 Syrians have converged on the Turkish Border trying to save their dear lives and feed their hungry kids. Bedouin Prince fly first class to shake hands with our Sinhala Buddhist Foreign Minister who has promised the Prince to hand over our Sinhala Buddhist brave soldiers to Prince’s White Judges to punish them for eliminating on Tamil Terrorists. Those Tamil Terrorists must be more important to the Bedouin Prince than the poor Syrians, who are getting annihilated mostly by Western friendly fellow Arabs and the poor Palestinians who are getting slaughtered by American supported Israeli Jews. shouldn’t we call this United Western friendly Nations. Or UWN instead of just UN. Well well well, when innocent Sinhalese were slaughtered between 1987 and 1990, where were you? When innocent Tamil civilians were slaughtered where were you? By the way, Hindia, the Americans, British, Israel ….. were all here to facilitate the mass killing of your own brethren including Trinco Sam’s people. The Prince presence in this island is to assure the war criminals that nothing is going to change, and Sarath will still be Field Marshall, MR Gota gang will still be flaming racists fire, ….. and you will still be ranting about the usual. What the Prince will insist is a bogus slow process to delay, subvert truth finding, and eventually absolve the war criminals. You don’t need a PhD to understand how UN works. If you are in doubt please ask the war crime denier a PhD. The opposite to what he says would be true. For a stupid of course. The low life pariah from the south named KA Sumanasekera has spoken again. What machine ever produce this disgusting pig nobody knows. Your parents should have adopted a dog instead of having you. Buruwanse et al will paint all these in his versions but in favour of Rajapkashe soon. Then the stupidity masses would feel that the current regime is working on the agendas of WESTERN power. They should be made very clear that UN is for all nations. They are not western powers. Interdependence while living with other communities what we have to learn. Rajapakshes feel breaking away from SLFP could not end up with all defeats – but this comes from a political teeniboy such as GOTA. They are now so offended by all the investigations being made on them. I think even though bit slow, with band leg moves – the current regime under the lead of Prez Sirisena is doing a great job. You need to learn a lot ! When you last had a drink with KAS and I, just before you passed out after your 7th bottle of Barbican, you agreed that the LTTE was created, trained, armed and funded by India. So, maybe the Bedouin Prince is here to collect evidence against the IPKF, who attacked the Jaffna hospital where, without any hesitation, they killed doctors, nurses, hospital workers and patients. Why should we care about any UN panel, since David Cameron has branded the UN panel’s ruling over the Julian Assange’s case, as “ridiculous’’! “The government does not agree with the assessment made by the majority of the ‘working group’,” the foreign ministry said in a letter to the UN panel, adding that the body does not have the right to “interfere in an ongoing case handled by a Swedish public authority”. If MR was here this kind of drama would never happen. This guy should be packed back to his western masters. Alas this treacherous gov will lock his feet. He will do his pilgrimage to the north to visit the imaginary tamil president wegi. What treachery by this gov. Just refer Sri Lanka to the ICC, for a cost effective and for quick delivery of justice. Stop the hamoerage. In Tamil- homeland most tamils are dalits. In sinhala they were treated equal allowed to sinhala national anthem in Tamil. First the TRUTH, how and why more than 100 000 killed and by whom, then ACCOUNTABILITY and JUSTICE. There will be no reconciliation without the above. We all want peace and to move forward with mutual understanding and separation to face the future. There shall be no deal, for war crimes, crimes against humanity and the committed genocide. Crime does not pay, karma would. Just US-educated Muslims working the Christian Agenda. Why they are silent bout arab spring in the middle east. In syria people are ding out of starvation. Saudi arabia is bombing Sudan and Yeman. UN is just a western mouth piece. Anyway, he looks like a gentlemen, because he is educated and qualified just carrying the christian agenda of the west. When and where will Don Qiowansa start his ‘fast’? Who will bring him his mug of nourishing Nestomalt this time? The “Real” Minister of Foreign Affairs is standing behind Mangala Samaraweera,with pursed lips. Something sinister seems to be cooking up in her mind. After all body language NEVER lies.Gota and Mahinda will swoon on seen her like this, with an ill fitting kurtha and all. After all she was an influential woman in their camp only just over a year ago. Talk about human amphibians? Geneva here she comes, ravi make way!! We have been doing that from 60’s and will continue the tradition. Why we wanted to talk about Dalit , Muslims, Christians, parava, kandian, etc. without talking the fact. Before the foreign invasion, there was a Tamil kingdom and Tamil king. Say all the Tamils from North are Dalit people, never mind, let them rule themselves and live their own life, why Singhalese wanted to mingle with them. The fact is when West gave all the support to defeat LTTE, Singhalese were very happy to receive help stretching tow alms but now you do not want west to interfere – it is not one way traffic. You can’t use West, India, China etc. whenever wanted and wash your hands after that – no use and throw business- very dangerous game – idiots game – one day have to face the consequence. If you still save MR and Gotha, surely srilanka will perish and people will stave to death one day. If Americans can kill Iraqis, and no resolution was taken against them, then why do they want to take resolution when we kill Tamils? 1) Dalits are ‘untouchables’ predominantly in India and Nepal. That particular type of caste system is not prominent anywhere in Sri Lanaka. The caste system in Tamil area in Sri Lanka is unique to Sri lanka, which excludes Christians and Muslims who are inhabitants there. To say ‘most Tamils are Dalits in Tamil area’ is utterly nonsense. If you think it is nonsense to say most Sinhalese in HAMBATOTA are Dalits, then it is extend that conjecture to Tamil area. 2) If the argument is that Tamils are treated equally in Sinhala area, because Tamil national anthem is sung in 2016, then the author agrees for the past 67 years Tamils are not treated with par. 3) According to Wikipedia, there are 2 lakhs Dalits in Canada. Does that mean Canada discriminates against Dalits? Caste system and racial inequalities are distinct frameworks. It is theoretically and politically inappropriate to mix them. 4) Bear in mind caste system exists in Kandy and Galle. One cannot conveniently conceal the truth for their political advancement. AJ, frankly speaking, Singhalese did not kill Tamils one to one. West, India, china indirectly killed Tamils but Singhalese instead of safeguarding Tamils, supported foreigners to kill their own country men and how can they claim one country now. I do not blame Gotha because he is not normal but MR shouldn’t have allowed him to do the crime. India should ensure high comm. does it , instead the Govt. trying to challenge the UN chief on the last agreement, as communal drums will be beaten by so called united opposition,saying the govt.has given into UN’s demand to charge the army men, who won the war for them and that is enough for the gullible people to topple the current Govt.as this is a sentimental matter for the majority people. UN takes years to settle human rights violation cases like in Africa and delays are not something new with UN. The Govt. should play it safe, not to antagonize any party in the conflict by denying the charges. In order to cool the Tamils on this issue ,the Govt. should ensure that Tamil issues are settled one by one at the earliest in order not to stir up the Tamil community, TNA and Mr. Wigneswaran of all people, who could go to courts on war crime issues. Release of political prisoners and compensation for the loss of loved ones to the close relatives and introduction of 13A in full should take priority. Sri Lankan penal code defines degree of murder by ‘intent.’ If one person hold a torch light in the night, so his accomplice can stab somebody – then according to sri lankan penal code both are EQUALLY guilty of murder. Person who was holding the torch light cannot claim, I was just holding the torch light. Therefore, I didnt murder. Likewise it does not matter whether Sinhalese killed the Tamils directly or indirectly. The ‘intent’ that matters when it comes to murder. Likewise, Convention on Genocide stipulates it the Genocide must be defined in terms of ‘intent’. Not in terms of how many people died. If the government found only 4 people were killed in the war for example, it doesnt matter. It is the intent that matter. The “Real” Minister of Foreign Affairs is standing behind Mangala Samaraweera,with pursed lips. Something sinister seems to be cooking up in her mind. After all body language NEVER lies.Gota and Mahinda will swoon on seen her like this, with an ill fitting kurtha and all. After all she was an influential woman in their camp only just over a year ago. Talk about human amphibians? Geneva here she comes, ravi Ari make way!! Whom to tell aney. Why are most of these people being emotional and spewing emotional crap, The issue here is Mullivaikal and what happened there during the latter stages of the civil war where the international rules of engagements were blatantly and willfully broken. It is the country and the then president himself along with his brother stands accused. Is it so hard to understand people. if you are the so-called intellectual base of the country the mind boggles. There is enough crap in Sri Lanka to keep pointing fingers people all the way back to the Idiot SWRD Bandaranaike and his ill-conceived legislation which culminated in the bloody massacre at Mullivaikal. So forget all that and stick to the bloody issue at hand. We are only concerned about Sri Lanka and its problem at this juncture and no other. Please do not mix apples and oranges.